The below photo was sent to me by Vinu who has kindly allowed me to use it on my website. 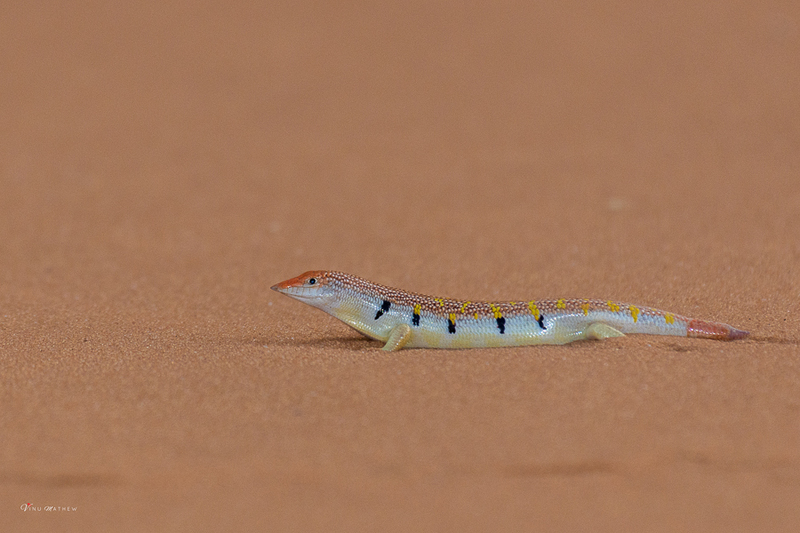 Vinu found the Eastern Skink Scincus mitranus near Al Kharj and it is a lizard from the skink family that grows to a length of 20 centimetres. 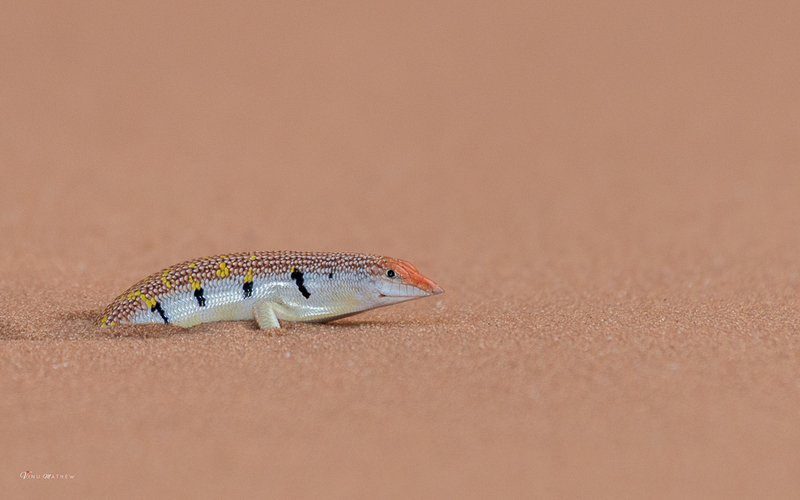 The Arabic and local name for this lizard is Sqnkor. They have an orange-brown or sand-coloured back, and a white underside and on the side they have a line or spots in a light colour, and the back and legs have vague dark bands. The snout is shaped like a bill, and the legs and tail are short. The Eastern Skink can run quickly, or slide over the sand and dig itself in quickly when it is in danger. Its food consists of several kinds of arthropods, especially Centipedes and beetles and although the ear openings are small, these skinks have excellent hearing, which enables them to detect insect prey moving below the surface. This species is found in the Arabian Peninsula, including Saudi Arabia and western Iran and they live in dry and warm open areas, particularly in sand deserts. It is widely distributed in the Arabian Peninsula, east of the Asir Mountains and is found from sea level up to around 1000 metres above sea level. Its habitat consists of loose sand dune habitats and hilly landscapes with occasional dense bushes and rocky patches to hide in. Owing to their remarkable ability to seemingly ‘swim’ through sand, they are often known as sandfish. The physical adaptations that allow these lizards to move with speed below the sand surface include a streamlined body, highly polished skin, strongly developed limbs, a chisel-shaped snout, and reduced ear openings.